Just as we are about to transition from President Benigno Aquino Jr. to President Elect Rodrigo Duterte, and the Philippines is sitting on a failing grade for the Millenium Development Goal’s HIV Program, some youth and adolescents join forces to campaign against HIV Stigma and promote awareness and family discussion about a virus that has been infecting some 27 persons a day. 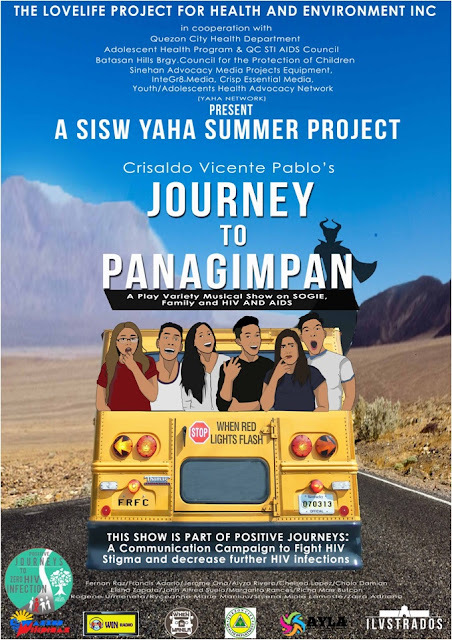 The Youth/Adolescents Health Advocates’ Network or YAHA Network will stage a play-variety-musical and interactive show “Journey to Panagimpan”, written by Crisaldo Vicente Pablo and directed by Ryceanne Manlulu and Francis Adarlo, on Saturday, June 4, 2016, at 6 pm at the Quezon City High School, Scout Ybardolaza corner Kamuning Road, Quezon City. “Journey to Panagimpan” is a comedy drama musical show on adolescent gender identification and expression, parenting and family support, HIV and AIDS. The show is part of The LoveLife Project’s campaign “Positive Journeys: Adolescent Moments of Confrontation with HIV” which has a series of workshops on HIV for adolescents and parents, a community and campus tour of the advocacy movie and/or the interactive play variety show. The LoveLife Project is about to shoot the advocacy movie “Ang Timeline ng Buhay ni B” about an adolescent who gets infected with HIV and his journey through life as a person living with HIV. In partnership with Quezon City Health Department’s Adolescent Health Program and the QC STI AIDS Council, The LoveLife Project for Health and Environment Inc., InteGreat Media Inc., Crisp Essential Media, National Youth Commission and Batasan Hills Barangay Council for the Protection of Children, The LoveLife Project recently conducted an independent advocacy media acting and production workshop for adolescents with attendees coming from Quezon City Barangays Batasan Hills, Commonwealth and Kaunlaran, Cubao.The LoveLife Project is composed of award-winning media professionals who believe in holistic approach to being healthy, happy and productive. The LoveLife Project intends to work with government agencies and private institutions to design a massive multimedia program on HIV education, inclusive of gender and sexuality, adolescent wellness and empowerment. If you are an advocate or you want to learn about HIV in a fun and more realistic venue, come see “Journey to Panagimpan” and by buying our P100.00 donation ticket, you are able to help the youth performers, production team and our cause. Funds raised through tickets will be used to further develop the show and to fund our free community screenings. YAHA and The LoveLife Project believe that educating people, especially the youth about HIV and AIDS should not focus on sexuality alone, but should also tackle other aspects that affect an adolescent’s decision making and lifestyle choices that can put him or her in or out of risk. The Creative Executive Director of The LoveLife Project is Mr. Crisaldo Pablo, who started the mainstreaming of independent digital movies in the Philippines and is considered to be the Father of Queer or LGBTQAI Cinema Mainstreaming in the Philippines. Mr. Pablo is a producer, writer and director for a major network and owns an independent media production company. The LoveLife Project for Health and Environment Inc. is a non-profit organization composed of media professionals with more than twenty-five years of extensive work experience and they believe in a holistic approach to being healthy, happy and productive. They intend to work with government agencies and private institutions to design a massive multimedia program on HIV education, inclusive of gender and sexuality, adolescent wellness and empowerment. The Youth/Adolescents Health Advocates’ Network or YAHA Network, a program of their organization for adolescents, will stage a play-variety-musical and interactive show “Journey to Panagimpan”, written by Crisaldo Vicente Pablo and directed by Ryceanne Manlulu and Francis Adarlo, on Saturday, June 4, 2016, at 6 pm at the Quezon City High School, Scout Ybardolaza corner Kamuning Road, Quezon City. “Journey to Panagimpan” is a comedy drama musical show on adolescent gender identification and expression, parenting and family support, HIV and AIDS. The show is part of The LoveLife Project’s campaign “Positive Journeys: Adolescent Moments of Confrontation with HIV” which has a series of workshops on HIV for adolescents and parents, a community and campus tour of the advocacy movie and/or the interactive play variety show. The LoveLife Project recently conducted an independent advocacy media acting and production workshop for adolescents with attendees coming from Quezon City Barangays Batasan Hills, Commonwealth and Kaunlaran, Cubao.